Indonesia is a great nation. It is rich in culture and traditions. In South Sulawesi Province, many types of traditional performances are available. For instance, it is Marendeng Marampa Dance in Tana Toraja Regency. It is actually a traditional dance of Tana Toraja. It combines good beautiful movements, music, and lyric. Today, travelers won’t miss an opportunity to witness such dance when visiting the region. The movements are simple but these look quite beautiful. Not to mention the audience has the chance to learn the meaning of the lyric and enjoy mesmerizing music during the performance. Most of the dancers are women. They wear a bright colored costume with simple ornaments. For female Moslems, they are allowed to wear a hijab. That means everyone can perform the dance regardless of the background. Usually, the dance is performed in an open field. The performance is available during either during a special occasion or regular days. Still, tourists should learn the schedule first prior to visiting Tana Toraja Regency. This way, you can avoid disappointment. Make sure to come with your family, too! 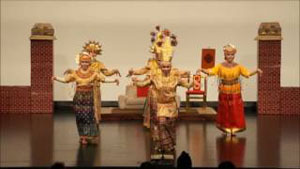 The audience can enjoy many things from Marendeng Marampa Dance. These include the folk song, dance movements, and beautiful music. All of them combine into one entertainment. Since the dancers are mostly women, the moves become more beautiful. What about the male dancers? Today, it is rare to see male dancers joining such dance. For male tourists, it is possible to learn and join the dance with the locals. You only need to talk to the villagers. They will teach you how to perform it like a professional. As for the tips, it is better to give some money. There is no such thing as free stuff, isn’t it? The dancers perform Marendeng Marampa beautifully. Both the moves and their attributes are entertaining. The thing is the dance requires a good stamina. Some moves of the dance involve numerous types of acts, actually. The dancers even jump during the performance. Apart from the movements of the dancers, the audience may notice some traditional musical instruments. These include Toraja drum, keso-keso, and pa’bas. All of them produce beautiful and mesmerizing sounds. In some occasions, this dance also features other performances. For example, there is Pagellu Dance. Tourists have different reasons to enjoy Marendeng Marampa Dance. Most of them are attracted to the distinct moves of the dance. The others enjoy it as the serene music and folk song during the performance. Also, some tourists take this opportunity to capture pictures using a camera. What about you? Marendeng Marampa Dance is available in most villages in Tana Toraja. From Makassar, a trip to Tana Toraja Regency takes about 7 hours and 30 minutes. The distance between these two locations is 315 km. Travelers often take Poros Barru-Makassar Street for the fastest trip. That means you should use the same route, as well. When it comes to the type of vehicle, a car is the best choice.